Bus and Truck Parking, Business Center, Fitness Room, Pet Friendly, Free WiFi. Located in Stapleton, this hotel is 1.5 mi (2.5 km) from Johnson and Wales University and 1 mi (1.6 km) from Northfield Stapleton. Denver Zoo and Denver Museum of Nature and Science are also within 3.5 mi (5.6 km). Along with an outdoor pool, this hotel has coffee/tea in a common area. Free continental breakfast, free WiFi in public areas, and free self parking are also provided. 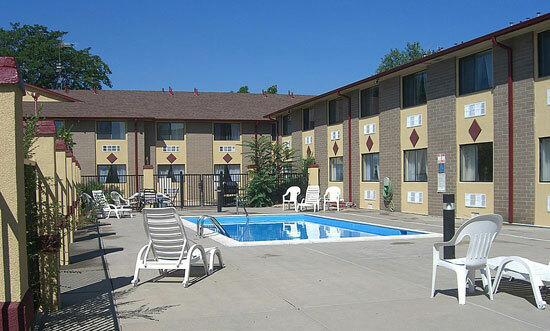 Additionally, a seasonal outdoor pool, a business center, and dry cleaning are onsite. All 115 rooms provide conveniences like refrigerators and microwaves, plus free WiFi and TVs. Guests will also find coffee makers, free local calls, and hair dryers. Activities : The Mile High City and the nearby Rocky Mountains are filled with outdoor recreation thrills for the whole family. Urban sophistication meets outdoor adventure in Denver. Get acquainted with The Mile High City and find out what Denver has to offer you and your family and friends. Airport : Denver International Airport 8500 Peña Blvd, Denver, CO 80249 Phone: (303) 342-2000 Denver International Airport is the 15th-busiest airport in the world and the fifth-busiest airport in the United States. Attractions : Since its Wild West beginnings, Denver has attracted all kinds of people. The rich ethnic history and diverse cultural heritage of the city are celebrated with a number of events and fun filled attactions throughout the year. Dining : Denver's reputation for fine dining has risen enormously in recent years, thanks to award-winning chefs, innovative chef-owned eateries and a focus on locally sourced cuisine. Denver chefs are regulars on the Food Network, the Travel Channel and such shows as "Top Chef." Many Mile High City kitchen wizards make frequent cooking appearances at the famed James Beard House in New York City. Downtown : Downtown Denver. From its early beginnings during the Gold Rush era, The Mile High City has always been a gathering place for diverse and creative people. Today, Denver is an outdoor city with a vibrant, walkable downtown offering urban adventures for all ages. Events : Welcome to the best source for schedules, venues and tickets for upcoming Denver events. Find local concerts, theater productions, festivals and more. Search Events click here. Golf : There are more than 200 public and resort courses in the state of Denver that are designed by world-famous architects and tucked into the most scenic nooks and crannies, all of the lush green fairways nearly outnumber Colorado's renowned ski slopes. Here's a look at some of the best public and resort courses you can play that are easily accessible from the Denver area. Government : Welcome to Denver, where 300 days of sunshine, a thriving cultural scene, diverse neighborhoods, and natural beauty combine for the world's most spectacular playground. Shopping : Shoppers, be prepared to leave your hearts in Denver. The Mile High City's beloved boutiques, shops, malls and shopping neighborhoods have grown exponentially as of late, so the list of where to shop in Denver is longer than ever. From cute indie stores to antique boutiques to souvenir and Western shops, Denver's shops are stocked with the best finds — so you may want to arrive with a little extra room in your suitcase. Sports : Denver Broncos The Denver Broncos are an American football team based in Denver, Colorado. The Broncos compete in the National Football League as a member club of the league's American Football Conference West division.